The work of tertiary and secondary school teachers is highly connected. In a small city like Macau, the student groups that both sectors serve share many of the same challenges, restrictions, and hopes. Despite what the two sectors have in common, there have been few public instances where an open exchange of ideas take place. 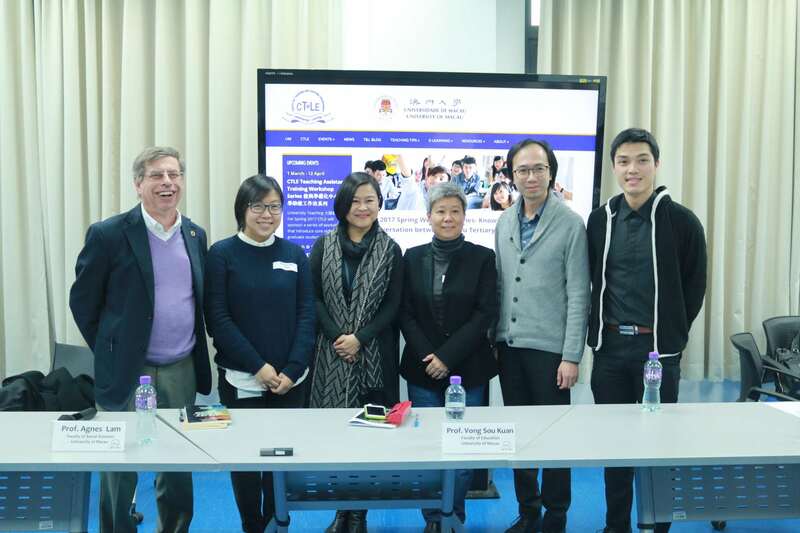 On March 8, 2017, CTLE and the Macao Association for the Advancement of English Language Teachers (MÆLT) co-hosted a panel discussion that aimed to allow exchange between secondary and tertiary teachers. 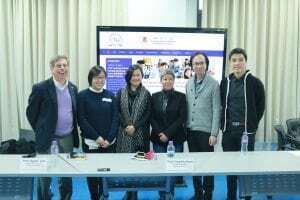 Four educators including Prof. Agnes Lam from Faculty of Social Sciences (UM), Mr. Andrew Lo Man Chi from Sheng Kung Hui Choi Kou School Macau, Mr. Jack Ng from Sacred Heart Canossian College (English Section), and Prof. Vong Sou Kuan from Faculty of Education (UM), were invited to speak on the panel. The speakers brought up a lot of insights and observations from their experiences. They pointed out changes that they observed in their students over the years, learning power that they have, and the increasingly changing demographics among them. It was mentioned that university students now, unlike those from one or two decades ago, appear to be less mature and independent. They seem to rely more on their professors’ step-by-step instructions as well as their professors’ reminders of basic classroom etiquette, even at the senior level. While there may be many factors contributing to this change, students’ eagerness to learn and their eagerness to succeed were emphasized. Despite this seemingly discouraging observation, it was also mentioned that our students now are highly creative and adaptable. Both Mr. Jack Ng and Mr. Andrew Lo suggested that if given the right guidance and opportunities, students are capable of achieving good results in both academic and extra-curricular events. Another important observation is the new demographics in Macao local schools. Examples of new student groups include: immigrant students, students with parents who work night shifts, and others. 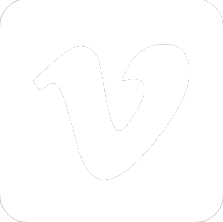 Because of the new demographics, students and teachers are faced with different challenges that were not that much of a problem ten or fifteen years ago. Since school teachers are the ones who see their students the most on a daily basis, they play an important role in their lives. This new role has become a consideration that teachers have to take into account in their teaching. Towards the end of the discussion, a question of great interest was raised – whose job is it to help students transit from secondary to tertiary education, school or university? This question raised a lot of discussion. What we heard from the panel was that in the school level, apart from preparing students academically for university, teachers also do a lot of work to cultivate students’ sense of responsibility and independence. In terms of tertiary education, it was mentioned that professors tend to be more understanding in students’ first year of study but their expectations increase as students progress in their university career. As the moderator of the discussion, I was inspired in many ways. What encouraged me the most was the passion of educators from both sectors. No matter what subject matter we teach, it seems that what educators care most about is our students’ desire to learn. We want our students to be creative. We want them to be responsible and independent thinkers. We want them to care about what they are doing. I would like to thank CTLE, MÆLT, all the speakers and participants on the day.